1. Using the thick paint brush, cover the cardboard or canvas with Modge Podge. 2. Stick tissue paper all over the canvas/cardboard. 3. Using the thick paint brush, cover the tissue paper with the modge podge. 4. 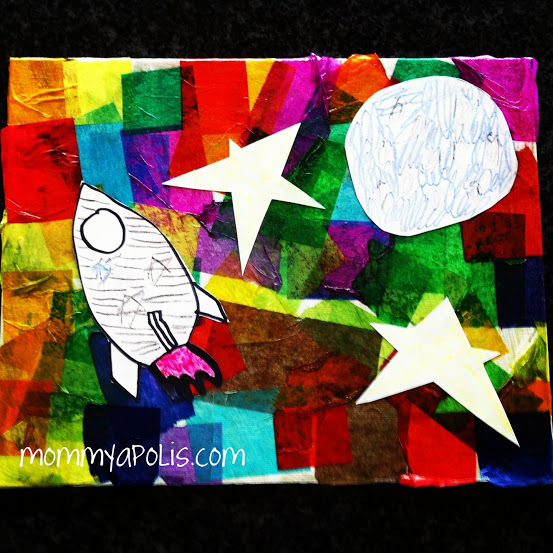 Have your child draw a space scene (or really anything will do) on a piece of cardstock or construction paper. They can color their picture in, as well… We used permanent marker to draw the pictures so that it would run when covered with modge podge. We colored our pictures in with oil pastels. 5. Stick the space scene on top of your modge podge tissue and cover this with more modge podge. When everything is dry you’ll have a great gift or decoration for your wall!